Redemptorist Publications is a charitable publisher based in Hampshire UK, with the mission to proclaim the good news and the Word of God among Christian communities. 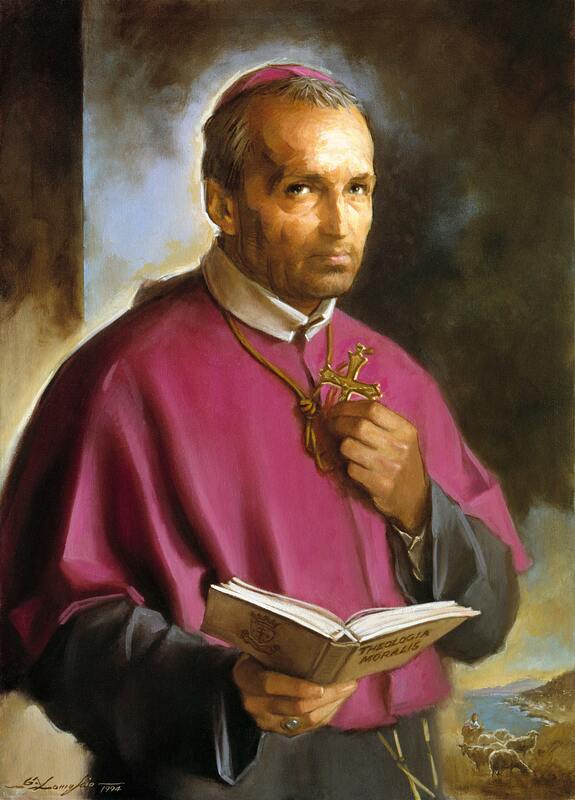 Following the steps of St Alphonsus Liguori, Doctor of the Church, RP takes the lead in communicating the Gospel in simple everyday language, by embracing the pastoral publishing needs of Catholics and Anglicans, at homes, in schools and churches. As a charity, Redemptorist Publications is made of people who give their gifts, skills and their life to the mission of helping other people with publications and media, aimed at educating, guiding and feeding souls. Fr Richard explain who Redemptorist Publications is and what is its role as a charity. We are more than just a publisher. We are a Christian mission and charity. Find out more about everything we do and how we help communities. Let us support you and connect you to more people through the Christian faith. Your financial support will be very appreciated and it will allow us to continue our charitable work. We exist solely to help to translate the Gospel message into the human words of daily life so that the Word of God might become flesh in the vulnerable loveliness of human hearts. We do this through our active engagement in publishing, producing high quality resources which offer support to individuals and to the wider Christian community on their journey towards God. Following the inspiration of St Alphonsus, we also strive to carry the Gospel message of loving compassion to people living on the peripheries of society, people whose concerns and needs might sometimes be overlooked. We work with Jesus, the Word of God, using human words to help his message of love to become real, active and relevant in the lives of the people who use Redemptorist Publications. Conscious that Jesus’ word touches every aspect of our lives, we also produce books and resources which help our readers to look more closely at scripture and understand its content. Jesus, the Good Shepherd, cares for his flock in all the varied circumstances of daily life. We strive to walk with him, creating resources which will support people in the ups and downs, ins and outs of their everyday experiences. We live in communities of varied needs. Community life is a source of joy and support but can also offer challenges to which we must rise if we are to grow and develop to our full potential. We strive to hear the voices of priest and people so that our many publications and other resources might help our parishes and communities to flourish. Encountering God leads us to pray but even Jesus’ disciples asked him for help with their prayer. We therefore offer a wide range of prayer resources for young and old, in all circumstances and at the beginning and end of life. Our dream is to take Jesus’ love to anybody and everybody, building up a community of faith, mission and compassion. Not only do we need to translate God’s message within our own hearts, we also reach out to others. As “missionaries of the Gospel”, Redemptorist Publications creates books and resources to inspire, encourage and support the Christian community in its daily life. As Christians, we want to learn about God and also to pass on that knowledge to others. We are heavily-involved in schools and produce materials which will help children and young people to learn, grow and develop in thoughtful and prayerful understanding. We work with educators at all levels, listening to their expressed needs. Through trying to meet those needs, we want to help them to be ever more effective in their valuable roles and responsibilities. People behind bars can feel forgotten and neglected. Prison chaplains can feel as though they are working in isolation as they face a different reality to that beyond the prison walls and security restrictions. Redemptorist Publications strives to walk alongside both inmates and chaplains, creating tailor-made resources to accompany the amazing transformations which happen when, perhaps for the first time, someone looks for Jesus and finds him standing, waiting with open arms. Jesus showed particular care for people whose illness or disability made them vulnerable and in need of an extra bit of care and attention, who looked for hope in the midst, perhaps, of darkness. We try to create materials which will offer encouragement and support as they face the challenges of daily life. We also work closely with those who dedicate their lives to creating community awareness and understanding of what it means to live with chronic illness and/or disability, producing resources - catechetical and otherwise - which will help them to nurture and sustain the hopes of the people for whom they care. We have all faced difficult times when we have wished for someone to listen to our story, perhaps explaining it to others, thereby offering protection and support. Our difficulties might relate to faith experiences but they might equally concern situations in the home, parish, school or wider society which might cause confusion or pain. We hope that, in looking for understanding and help, those who are suffering and in need, through Redemptorist Publications, will find something to sustain and encourage them. The sacraments celebrate key moments on our journey through life and towards a deeper relationship with God. That is why we strive to help parents, catechists and candidates through carefully crafted sacramental programmes. Supporting people’s ongoing understanding and appreciation of the sacraments is also an important aspect of our work. Redemptorist Publications unites itself with the Redemptorist Congregation (C.Ss.R.) in its willingness to listen, to respond and to help build communities of hope. We exist to help to translate the Gospel message into the human words of daily life so that the Word of God might become flesh in the vulnerable loveliness of human hearts. We do this through our active engagement in publishing, producing high quality resources which offer support to individuals and to the wider Christian community on their journey towards God. Like the C.Ss.R., we have adopted the unique icon of Our Lady of Perpetual Help as inspiration for our mission. A copy of the Icon can be visited at the HQ for the London Province, at Our Immaculate Lady of Victories, St. Mary's in Clapham, London.